A grandson tries to buy the corpse of Lenin on eBay for his Communist grandfather. A failed wunderkind steals a golden cross from an Orthodox church. A boy meets his cousin (the love of his life) once every five years in the river that divides their village into east and west. These are Miroslav Penkov’s strange, unexpectedly moving visions of his home country, Bulgaria, and they are the stories that make up his charming, deeply felt debut collection. In East of the West, Penkov writes with great empathy of centuries of tumult; his characters mourn the way things were and long for things that will never be. 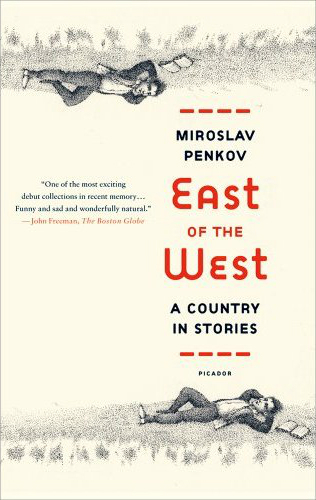 But even as they wrestle with the weight of history, with the debt to family, with the pangs of exile, the stories in East of the West are always light on their feet, animated by Penkov’s unmatched eye for the absurd. When I was a child, I did not much like to read, because I was lazy and preferred to play soccer outside. I did not like to be read to either, because repetition bored me and because my parents were really good story tellers – for years my mother told me about the adventures of two little hippos (brother and sister) who we’d send around the world and get into all sorts of trouble, while my father told me stories about Bulgarian history: khans, tsars, rebels fighting the Turks. As a college student in the US, I wrote stories of my own, pseudo-American stories influenced by my teenage love of Stephen King, a writer I still admire greatly. It became apparent, very quickly, that the fake American stories I wrote were unconvincing garbage. Taking a class in Western History, I was amazed to find out that the professor was writing his dissertation on janissaries in the Balkans. He asked me if I could translate a Bulgarian text for him. I was mesmerized, the way I’d been as a child, by our own history. How could I have forgotten it? Why was I not writing stories like these, packed with heroism, betrayal, courage and cowardice, freedom and death? And so I began this book. I wanted people to listen and be moved by our tales, and to show them that Bulgarians are not all car thieves and prostitutes, though there are plenty of those too. As a boy I’d listened to my father and felt calm and safe, and twenty years later I wanted to feel that same way. Writing about Bulgaria was the only way I knew that would get me back to Bulgaria – not just my family, whom I miss greatly, but also our muddy village roads, black fields, blue mountains... read the rest here. Buying Lenin was originally published in the Fall 2007 issue of The Southern Review where it won the 2007 Eudora Welty Prize in fiction. The following year Salman Rushdie and Heidi Pitlor chose the story to appear in the 2008 Best American Short Stories. Here is an essay on how the story came into existence along with a story excerpt. You can hear Salman Rushdie speak briefly of my story on the Leonard Lopate Show. I first met Vera in the summer of 1970, when I was six. At that time my folks and I lived on the Bulgarian side of the river, in the village of Bulgarsko Selo, while she and her folks made home on the other bank, in Srbsko. A long time ago these two villages had been one – that of Staro Selo – but after the great wars Bulgaria had lost land and that land had been given to the Serbs. The river, splitting the village in two hamlets, had served as a boundary – what lay east of the river stayed in Bulgaria and what lay west belonged to Serbia. I was born just twenty years after we got rid of the Turks. 1898. So yes, this makes me seventy-one. And yes, I’m grumpy. I’m mean. I smell like all old men do. I am a walking pain, hips, shoulders, knees and elbows. I lie awake at night. I call my daughter by my grandson’s name and I remember the day I met my wife much better than yesterday, or today. August 2, I think. 1969. Last night I pissed my bed and who knows what joy tonight will bring? I am in no way original or new. Although, I might be jealous of a man who’s sixty years dead. Read "Makedonija" in its entirety online at Five Chapters. It’s not like Grandmoms is urging me to steal from the British. But she knows I can’t help it. So when I walk under the trellis she looks up from her newspaper and says, Maria, today Missis was seen at the store with new earrings. Real pearls. She tells me to tie the end of a loose vine string and while I tie it Grandmoms says, I’m not saying, you know. But we could split it down the middle. I throw her this look. She says, Sixty-forty? and then she’s back to her paper. Turning one page and licking her fingers to turn the next, like the ink on her fingers is honey. 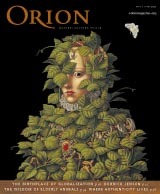 "The Letter" appeared in issue 13 of A Public Space and received special mentions in The Best American Short Stories 2012: Other Distinguished Stories of 2011 and The Pushcart Prize XXXVII: Best of the Small Presses (2013 Edition). Read more here. We’d learned about the in vitro program in Sofia last year, from a friend of my mom’s - a forty-something school teacher, who after many barren years was now, finally, the mother of twins – Lazar and Leopold, or some similar sounding madness. By that time, Yuki and I had been married and had tried to conceive for eighteen months. We consulted a doctor in Chicago, a Bulgarian my friends at O’Hare recommended. It turned out there was something the matter with Yuki’s fallopian tubes. It would be very hard, the doctor said, to get pregnant as nature designed it, though by all means, he said, keep trying. It would be easier to try other means, but these, of course, required hefty sums. I am a luggage loader at O’Hare. Yuki waits tables at a low-level sushi restaurant, imaginatively named Tokyo Sushi, and on the side baby-sits youngster Americans, whose parents have deemed her speaking Japanese to their children somehow beneficial. We cannot produce hefty sums. 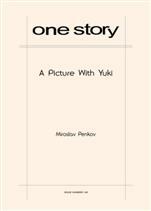 "A Picture with Yuki" appeared in issue 148 of One Story and was made into a feature film. A Bulgarian-Japanese co-production, the film was directed by Luchezar Avramov and starred Kiki Sugino, Ruscen Vidinliev, Dimiter Marinov (Green Book), and Bulgarian Olympic boxing legend Serafim Todorov. The film premiered at the Sofia International Film Festival in March 2019. Drugarki i drugari, dear comrades, please welcome the Amazing Rado! This is how my father introduces me to the crowd. For the past seven years, at least once a week. Nursing homes, neighborhood retiree clubs – of the retired engineer, retired welder, crane-operator. There I am, in a room that smells of lavender spirit, in front of two rows of wheelchairs, trembling chins, dangling tubes, bags of urine, doing my mnemonic tricks to weak, Parkinsonian applause. And after that my father begins his rounds among the rows, an empty 3-liter jar in his hands. The label on the jar is peeled off almost completely and on the white space Father has scribbled boldly - Amazing Rado’s Scholarship Fund. But if you look closely, you’ll see a corner of the original label still standing and then you’ll know – this jar was once full of pickled cauliflower. She fit like a stone in her father’s cupped palm when he first held her. Yellow palm, stained from stringing leaves of tobacco, and she bloody, blind, and quiet. She did not scream when her father took her. She did not breathe. A bloody stone was all she was back then. So her father shook her and smacked her face, and then she screamed, and then she breathed. He raised her up to the ceiling as if God had poor eyesight and wouldn’t see her down where she lay. He called her name, Kemal, which was his name really, the name of his father, and then repeated it, like a proud song, to make sure that up in the Jannah the angel had heard right and had written her name correctly in the big book. “You cannot give your daughter a man’s name,” the hodja told him. “It is well known, even before her birth, that my great-grandmother would be the most beautiful woman in the world. So on the day she draws her first breath men from all over come to pay her tribute. The line in front of the house is so long that it takes the last man twelve years before he finally falls at her feet and presents his gifts of honor. Because of my great-grandmother’s supreme beauty, the laws of cause and effect in the village break down for a while. An event is no longer followed by its usual consequence, but instead leads to something completely unexpected. This is first noticed when a few of the men waiting to see the newborn get so anxious that they start throwing stones at the house. Contrary to all expectations, the windows do not break, but the leaves on the nearby trees momentarily turn red and begin falling as if autumn has come months before its time. 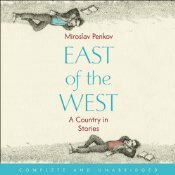 Five houses down, a girl desperately falls in love with her uncle because two kids try to drown a bag of black kittens in the river, and an old woman is run over by a bull because on the other end of the village a housewife forgets to put potatoes in the stew..."
There are eight stories in East of the West. Here you can find either the opening paragraph of each or an excerpt that I thought captures the story's voice. "... one of the most exciting debut collections in recent memory." "... Penkov's teeming stories accomplish in phrases what lesser writers take chapters to convey... a collection of triumphs." "... This is a sparkling collection.."
"... These stories are not the promising work of a first-time author. They are already a promise fulfilled--wise, bright, and deep with sympathy." "... heart-crushingly funny, stereotype-splattering creations..."
"...An unapologetic love letter to a culture of many colors." "Miroslav Penkov spins magical tales. There is great humor here, and wonderful characters you will never forget. You will love this book. I cannot praise it highly enough." "Miroslav Penkov is an extraordinary writer. There is a kind of magic at work in EAST OF THE WEST, a beautiful alchemy that combines wisdom and imagery, soul and story to render, finally, the pure gold these tales truly are. May many more books follow this one!" "I suspect that Miroslav Penkov would be a wonderful writer in any language, but lucky for us, it happens to be English, and what funny, tender, tragic, and soulful stories he spins from his adopted tongue. East of the West is, simply put, one of the best collections I have read in years, ambitious and accomplished enough in scope to encompass east, west, and all stations in between." "Miroslav Penkov unpacks his stories with great skill, drawing the reader so deeply into the world he has created that when the magic comes - a father wrapping his son's eyelash in a handkerchief - it knocks the wind right out of you. EAST OF THE WEST captures the moments that prove we are truly living." "There is something magical in Miroslav Penkov's stories. They evoke the forested mountains and peasant villages of the Balkans... But there is also something un-charming, un-picturesque, and un-romantic in Penkov's work, and this is what makes it important. His tough, true depiction of his tragic homeland's long history of wars, oppression, division, and genocide provides the real magic of this wonderful book." universal—of what it is to be a small part in a large story." The jacket art is the work of Peter Sis, an internationally acclaimed illustrator, filmmaker, painter and author. Mr. Sis was born in 1949 in Brno, Czechoslovakia, and grew up in Prague. He studied painting and filmmaking at the Academy of Applied Arts in Prague and the Royal College of Art in London. His animated work is in the permanent collection of the Museum of Modern Art. He came to America in 1982, and now lives in New York’s Hudson Valley with his family. Peter Sís is the first children’s book artist to be named a MacArthur Fellow. His many distinguished books include Starry Messenger: Galileo Galilei, Tibet Through the Red Box, Madlenka, Rainbow Rhino, The Tree of Life: Charles Darwin, and The Wall: Growing Up Behind the Iron Curtain.